While much of scientific research takes place in universities and think tanks, some would argue that its impact is ultimately measured by how many lives it touches and changes. Knowledge that does not leave the laboratory setting often lands in archives instead of benefitting society through influencing policy change. Often, this is the critique of academia, also dubbed as the ‘ivory tower’, oblivious to the realities of the world. 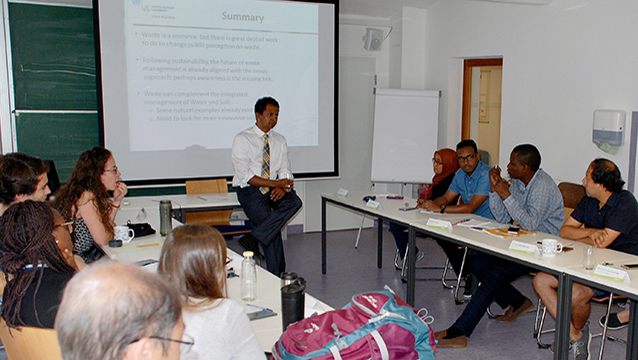 These were the main concerns raised at Prof. Hiroshan Hettiarachchi’s seminar at the Centre for International Postgraduate Studies of Environmental Management (CIPSEM). Addressing a group of 20 early- to mid-career professionals from 19 countries, the Head of the Waste Management unit at UNU-FLORES delivered a talk on “Managing Waste as a Resource Together with Water and Soil” on 28 June 2017. The participants are from the 40th International Postgraduate Course on Environmental Management and most are themselves environmental experts from developing countries, having been nominated by the ministries, NGOs, or state agencies that they work for to complete the six-month long programme. 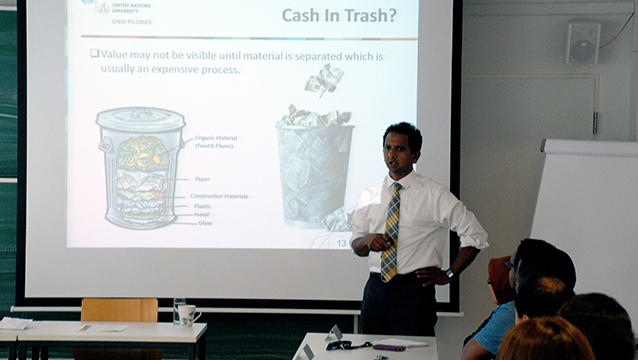 Following the invitation of CIPSEM coordinators, Hettiarachchi encouraged participants to think about how we regard waste: instead of a nuisance or a liability, it is in fact a rich and valuable resource. He offered insight on waste management, and in particular in its integrated management with other resources such as water and soil. Building on the concept of integrated management, Hettiarachchi explained how managing water, soil, and waste in a nexus may provide yet another opportunity to address bigger problems of humankind such as food security. He illustrated the potential of putting the Nexus Approach into action through the real-world examples of nexus solutions currently being pursued by UNU-FLORES and partners in Mexico and Iran. In a very engaging Q&A session, participants raised questions on a range of areas. They took interest in the set-up of UNU-FLORES vis-à-vis its research and interdisciplinary aspects, seeing how it distinguishes itself from the traditional university outfit. As part of a global think tank serving the United Nations, UNU-FLORES also takes part in capacity development in environmental resource management, especially focusing on the needs of emerging economies. In particular, they were interested to know more about the implementation aspects of the Institute’s work and how findings are disseminated among policy circles. Some had doubts about the applicability of university research, if the right mechanisms are in place to ensure that research is being considered in implementation practices. Hettiarachchi took the time to explain UNU-FLORES’s combined approach: while policy-relevant publications help the Institute reach out to a specific group of stakeholders, it is extremely important to contribute to journal-level publications in order to verify the facts and gain attention from the scientific community. In ensuring that knowledge leaves the ivory tower, we need to place emphasis on evidence-based policymaking and the reciprocal relationship between science and policy. Gremillion, Paul and Avellán, Tamara. 2016. Wastewater As a Resource: The Water-Waste-Energy Nexus in Sub-Saharan Africa. Policy Brief. United Nations University Institute for Integrated Management of Material Fluxes and of Resources (UNU-FLORES). Implementing a Nexus Approach: Does Governance Matter? 2016/06/08 Dresden, Germany Implementing a Nexus Approach: Does Governance Matter?